I am pleased to present my electronic newsletter. These e-newsletters enable me to provide information about issues, events and activities in Harrisburg and around the 21st Senatorial District to you in a timely manner while saving postage costs. If you find this e-newsletter useful, I invite you to visit my website www.senatorscotthutchinson.com for more information about your state government. If you do not wish to receive these e-newsletters, please click the “unsubscribe” button at the bottom of the page. 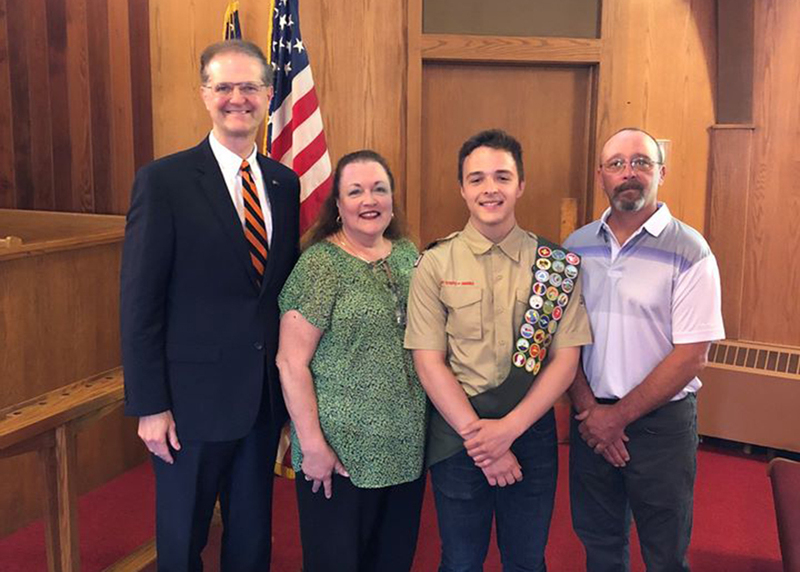 I recently had the honor of presenting a citation to Benjamin Nutt recognizing his recent achievement of Eagle Scout. Benjamin is a member of Troop 31 in Youngsville, and he has served as a Scribe and Senior Patrol Leader. For his Eagle Scout project he constructed a picnic table and two benches for a site that overlooks the river along the Youngsville bicycle trail. Congratulations Benjamin on your outstanding achievement. Two bicycling routes in Pennsylvania are now officially part of the nationwide U.S. Bicycle Route system. USBR 30 extends 46 miles along the shore of Lake Erie from Ohio to New York (locally known as BicyclePA Route Z) and runs along the nationally designated Seaway Trail Scenic Byway. Riders will enjoy sandy beaches, historic lighthouses, ecological diversity – as well as Presque Isle State Park, which is ranked as the #1 Freshwater Beach in North America. USBR 36 extends 398 miles through the center of Pennsylvania from Ohio to New York (locally known as BicyclePA Route Y) and follows much of U.S. Route 6 — which was one of the first highways used to move natural resources, people, and products across the country. The route showcases industrial history, including the first underground mine, the first steam locomotive, and the first lighthouse on the Great Lakes. Cyclists will also experience the Allegheny National Forest, Lake Erie, and the Pennsylvania Grand Canyon.